In the Olympic open, you can hear : " In the name of all competitors, I promise that we shall take part in these Olympic Games, respecting and abiding by the rules and govern them, in the true spirit of sportsmanship, for the glory of sport and the honor of our teams". The ancient Greeks held sporting contest over 2,000 years ago. In 1896, a French- man called Baron Pierre de Coubertin prompted the revival of the Olympic Games. The first modern Olympics were held in Athens, Greece in honor of their origin. Since then they have been held very four years, except in wartime. Water Polo, sport played between two teams in swimming pools with a netted goal set up at each end. The competing teams attempt to score points by throwing a buoyant ball into the opponent’s goal. Each goal is worth one point. There are two versions of water polo, and the two versions differ in minor ways, such as in the length of the field of play. Most international matches follow rules and regulations set by the Fédération Internationale de Natation Amateur (FINA; International Federation of Amateur Swimming). The game of sepak takraw is relatively easy to master—that is, if you're able to extend your leg well over your head while jumping, block a small ball traveling at 97 km/h (60 mph) with a flying headfirst leap, and perform a full-speed backward cartwheel that is timed to spike the ball into an area the size of a badminton court. These are some of the maneuvers regularly practiced by skilled participants of sepak takraw, which the United States Takraw Association calls “volleyball, gymnastics, and soccer all rolled into one.” ”A game of world-class takraw seems to defy gravity,” according to Sports Illustrated. These five rings -- blue, yellow, black, green and red -- represent the five parts of the world now encompassed by Olympism and ready to compete against each other. Moreover, the six colours (including the white background) thus combined represent those of all nations, without exception. The blue and yellow of Sweden, the blue and white of Greece, the French, English, American, German, Belgian, Italian and Hungarian tricolours, the yellow and red of Spain are side by side with the new Brazilian and Australian flags, the old Japan and the new China. It is a true international emblem." Coubertin (Selected Writings II, p. 460, 1913). From Little League to the World Series, baseball is the game that most Americans know best. The sound of baseball games is the sound of summer across the United States. Our talk is sprinkled with phrases from baseball. We say of a strange idea that it’s come “out of left field.” “Hitting a home run” signals success. “Throwing a curve ball” means giving somebody a surprise. Most Americans have played some form of baseball. The game has been called America’s national pastime. 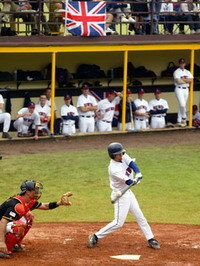 It’s also the most popular team sport in Japan, Cuba, and other countries.